This project is investigating the ecological response of the aquatic vegetation communities to water quality changes and water regime. The main study site is Lake Brewster with comparisons also planned for Lake Cowal and Lake Cargelligo, all of which are situated in the mid section of the Lachlan river catchment, and each with differing levels of human use/impact. 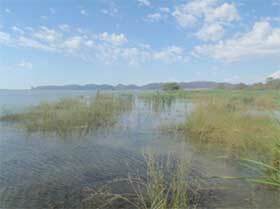 This project will establish whether water quality and water regime (either singularly or in combination) influence plant diversity, growth, biomass, seed viability and/or seed bank emergence, and if the species composition of a wetland has a significant effect on the water quality and chemical composition. A combination of field vegetation surveys and controlled laboratory experiments will be used to determine what effect water quality and water regime have on aquatic plant communities and provide a basis for developing a conceptualised ecological model of Lake Brewster. This will take into account seasonal changes, known variability and ecological relationships as a means for identifying the hydrological and water quality requirements of the current vegetative communities in each lake. A report will be prepared in 2014 for the project sponsors.